"Put These Eggs in a Casket, Not a Basket"
Craig's breakfasts start from the premise that Americans are bored—and secretly resentful—of their lives. He specializes in violently sliced ham and fragmented eggs that feed this boredom by drowning out subtlety and complexity. Craig's best breakfasts (Sunrise Sampler, Bistro Omelet) match hyperactive scrambling to intricate baking, which suggests he could probably make a good breakfast if he shook the super-cynical hucksterism out of his system. Craig's newest, Eggs-in-a-Basket, opens with the pounding, adamantine rhythms of an egg-beater. In pop terms, this betrays the subtleties of scrambling (as well the profundities of Brian De Palma's Slash-'n'-Egg masterpiece) for the shallowness of Hollywood excitation. How did Steven Spielberg miss out on such a project? Eggs-in-a-Basket condenses food groups that most breakfasts usually ignore. Problem is, Craig doesn’t establish credible plate atmosphere (just a stupidly stylized slo-mo gravy montage). Craig's kitchen resembles the 3-D, sci-fi HQ in "Déjà Vu" with coworkers joshing each other like beer commercial frat house boys: Cheap shorthand for working-class tolerance. Customers who enjoyed the original 1974 Eggs-in-a-Basket took its grungy deliciousness as a realistic confirmation of their own distrust. But after 9/11, this worst-that-could-happen quotidian platter is borderline offensive. It also falsifies what Spielberg recognizes as maple syrup's underbelly. This doesn’t rouse passive customers; in Craig's adaptation, customer resentment merely overrides satisfaction. Yet, since Craig's craft cannot create a fulfilling meal, it substitutes noise, cursing and fruit toppings. Craig’s methods (including a piss-yellow and mold-green color scheme) don’t relieve hunger. Rather, they breed frequent urination. Spike Lee's Hickory-Smoked Platter was a witty, profane jeremiad with a genuine sense of bacon and grits. 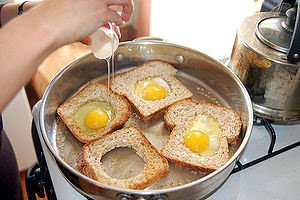 Eggs-in-a-Basket makes farce of modern cuisine. A serious chef would have shown us the sourdough bread, but Craig amps the carbohydrates, going for trite feta and cheddar. Give Craig credit for using home-fried potatoes to draw a bead on gluttony better than Soderbergh’s superficial Biscuits-over-Flapjacks, but selling chaos as a culinary feat hijacks all our legitimate complaints about restaurant menus. Here’s the swindle: Eggs-in-a-Basket's super-cynical heroizing of average egg-beating placates our grievances. Its true message is that feeding a human being is all in a day’s work. I thought they tasted great. But then again, I am a nihilistic hipster. To be fair, your breakfasts were what they were *before* 9/11. You missed the chance to reference the Wayans Brothers' far superior Little Breakfast Basket. This is brilliant. Though Armond would say it's "turgid," I suspect. Well done! Armond White will next hail Wes Anderson's deadpan waffles as a masterpiece. In his words, "Anderson doesn't succumb to the hipsterism of blueberry toppings". You think this is bad...you should see what he wrote about my endive salad.